These were the opening words of Mr. Peter Mazunda, Board Chairperson of the Special Olympics Malawi (SOM), in his speech during the signing ceremony of The Lilongwe Declaration on Intellectual Disability held on June 4, 2014 in Blantyre, Malawi. This colourful event actually was a follow up to the successful African Leaders Forum on Intellectual Disability held in Malawi from February 9 to 11, 2014, which among other things called for enhanced networking & partnership-building amongst all the delegates that attended the forum. 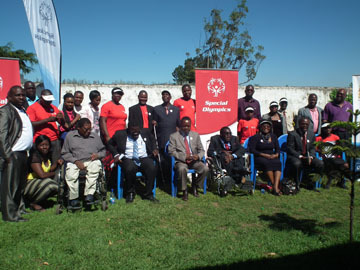 Mazunda was speaking to the participants who had come to witness the event from various Disability Peoples Organisations (DPOs), while others represented families of children with intellectual disabilities as well as athletes with intellectual disabilities themselves. Significantly, present at the function was the Guest of Honour, Principal Secretary for the Ministry of Disability and Elderly Affairs Mr. Fletcher Zenengeya. “All groups of people with disabilities face challenges. But people with intellectual disabilities, you will agree with me, constitute one of the groups with more serious challenges in their day to day lives,” said Mr. Zenengeya. Besides reassuring Government’s commitment and outlining some of the policies and programs aimed at enhancing the welfare of persons with disabilities, particularly those with intellectual disability, that his ministry has put in place, he also hailed the role that SOM, the Federation od Disability Organisations in Malawi (FEDOMA), and the Southern Africa Federation of the Disabled (SAFOD) play in advancing the rights of persons with disabilities within Malawi and abroad. On his part, FEDOMA Executive Director, Mr. Action Amos, said it a fact that there have always not been enough attention given to human rights dimensions, especially on disability discourse. It was for this reason that FEDOMA courted the political parties that were vying for office during the run-up to the recent 2014 Tripartite Elections to sign a “Social Contract” binding them to align – and realign – social programs so that they mainstream issues affecting persons with disabilities when voted in office. The newly elected party, the Democratic Progressive Party (DPP), was among the political parties that signed. “We regard as a very positive consideration that the incoming Government indicated its seriousness in attending to issues affecting persons with disabilities in Malawi,” he said. SAFOD Director General, Mussa Chiwaula, said the event was a milestone in the advocacy for the promotion of rights of Persons with Intellectual Disability not only in Malawi, but also within the international fraternity. He said SAFOD, being the leading Southern African disability-focused NGO engaged in coordination of activities of organisations of Persons with Disabilities in the SADC Region, was determined to play its part in bringing the Intellectual Disability agenda at SADC level, hence our active involvement in Malawi. “This signing ceremony is just one positive step towards the work that we intend to carry out in the region – in all the countries that we work in namely Malawi, Zambia, Zimbabwe, Mozambique, South Africa, Botswana, Lesotho, Namibia, Swaziland, and Angola,” he declared. 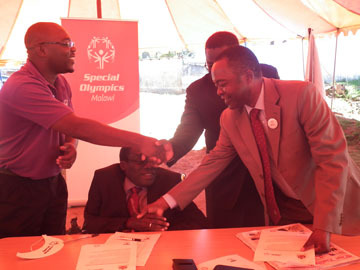 Chiwaula said in support of the United Nations Convention on the Rights of People with Disabilities (CRPD), would work in partnership with Special Olympics, affiliate national federations, civil society and key development organizations to encourage African countries, particularly those in SADC, to integrate Persons with Intellectual Disabilities fully into their communities, and into development strategies. It is now official that Malawi – perhaps by virtue of being the host of the frican Leaders Forum on Intellectual Disability – became the first SADC country that has endorsed the Lilongwe Declaration on Intellectual Disability. Now all eyes in the Disability Sector will be on the next country in the region to follow suit.